You can recover and retrieve entire data from a flash drive. The USB drive is scanned completely by the pen drive data recovery software and the data available in it is loaded which can be extracted and saved at desired location on the local machine. Deleted items cannot be recovered using this mode. Deleted files always prove to be a nightmare. If you have got some items deleted at the time of transfer or exchange of data then it is feasible to recover the deleted items using Pen Drive Data Recovery Software. 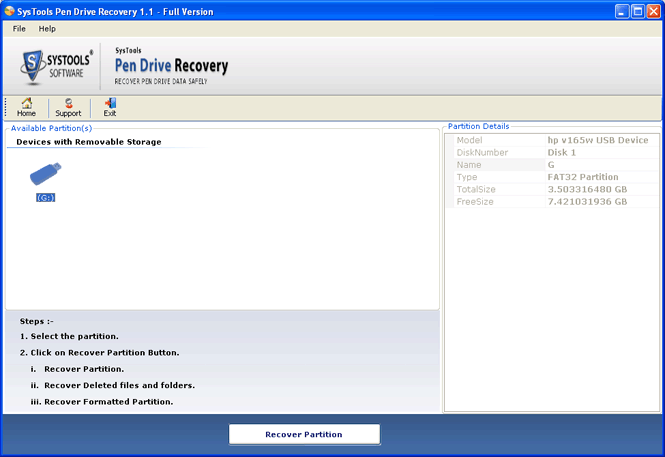 The pen drive recovery tool thoroughly scans and recovers the deleted items. This trust worthy solution recover pen drive data supporting both FAT and NTFS file system. The pen drive data recovery tool is provided with advanced algorithm through which it can recover data from the pen drive/USB drive supporting any of the above file system formatting. On selecting removal disk and type of scan for the device, the pen drive data recovery software displays a live scan report. The report is displayed separately in a pop up window that contains the name of selected drive, bytes read, total size, file scanned and number of folders. Complete details associated with the external device like pen drive can be viewed by the pen drive recovery software. This includes the name of the external device, model, type, total size, free size etc. Data can be restored by the pen drive recovery tool as long as the device is detectable by the Operating System. The pen drive data recovery tool is provided with robust search option in order to quickly find the desired item from the retrieved items. You need to type a text or term which matches with the file name that you need to search. With this feature you can obtain the required files or folders quickly. Once the pen drive recovery tool has recovered the affected data, a preview is provided for the users. You can extract the recovered items at any specified location on the machine according to your choice. Extraction is done by selecting the check boxes provided with the files or folders or by holding CTRL button. Pen Drive Data Recovery software is a Windows based software and is highly compatible with different versions of Windows Server. The pen drive recovery tool is always kept updated and one can successfully perform recovery of deleted, corrupt and formatted drive. The tool is supported by Windows 8 and all below versions. In order to transfer and exchange data, pen drives are frequently used. It can get infected by virus attack, bad sector formation, improper ejection or Trojan infections. A damaged pen drive can prove to be a threat to the local machine. However, the pen drive data recovery software can easily recover data from corrupt pen drive. Formatting is a common practice in order to get rid of virus and make pen drives clean. However, you can lose some useful data at the time of formatting. With the help of Pen Drive Data Recovery Software, you can recover the formatted partition effectively and with ease. On installing and operating the pen drive data recovery software on a local machine, removable devices are automatically listed in the panel of the software. You can select the desired recovery type and preferred flash drive according to the issues with the data. The pen drive data recovery Tool successfully perform recovery task without any problem. You can recover data from the USB flash drive using Pen Drive Data Recovery Software in two different ways depending upon the requirement: Scan for, Deleted, corrupted files and folders and Formatted Scan for formatted data. Small sized and portable devices that are much in demand to share data is Pen Drive. Removable, available in different shapes, and most importantly capable of storing large amount of data, this external storage medium can be purchased at a low price. Just like any other storage device, pen drives also have an abstract mechanism to read/write, open/close data from it. This is defined by the File Systems that defines a structure as how data should be saved on disk. FAT: By default, most of the pen drives are FAT32 formatted. It can hold a system volume of 2TB. The files stored on partition with FAT32 formatting can save data up to 4GB only. It is less fault tolerant. NTFS: Storage medias that are formatted with NTFS file systems are less vulnerable to damage and offers high capability to save data in a file. It allows saving a file up to 16TB which is huge. Pen drives can be manually formatted with NTFS file systems. The disk in drive F: is not formatted. Do you want to format it now. USB Device not Recognized Error. Pen Drive shows a memory of 0 bytes free space when it contains Data. To fix these problems and recover data from pen drives, there are tools available for help. Using pen drive data recovery tools, it is possible to restore deleted or formatted data from pen drives of either FAT or NTFS file system. How can I Recover Data from Pen Drive using this Tool? Install and Run the Software on your System. Select Scan Mode For External Pen Drive. Preview and Search Recovered Pen Drive Data. Save Data at Any Location in your System. Can I recover deleted items from the flash drive? Where will the software save the recovered files? I have a large number of files in my pen drive which is to be recovered. Is there any provision to manage the files? Will the software recover data from a flash drive which is not detected by the local machine? Can I use the software on Mac OS Machine? No, the usb data recovery software is a Window oriented tool and is not compatible with Mac OS. Is the software needs any additional application? No, The Pen Drive Recovery Software is a stand alone utility. You need to just install on Windows OS system and easily get back lost data. Can I recover selective file(s) from my pen drive? Is the Software able the recover permanently deleted (shift+del) data from pen drive? Is the tool crack version available? No, Pen drive data recovery software crack version is not available. I had stored my data in pen drive. After few days my data is corrupted. Is the tool able to recover corrupted data from pen drive? Yes, The pen drive recovery tool is able to recover corrupted data from pen drive. I lost my 64 GB data from pen drive. Can I recover my 64 GB data using this software? Yes you can, by using the pen drive data recovery tool. You can recover any size data like, 128, 256, 512, 1024 GB etc. Can I download free demo version of this software before purchasing? Yes, pen drive data recovery software provides you free demo version after that you can decide to purchase the software. Can I download pen drive recovery software crack version? No, It is not recommended to use pen drive data recovery software crack version. Because the crack version of the software may consist of hidden malware. So, it is not recommended download crack version or free serial key. My 32GB pen drive had crucial business data in it. Thanks to this pen drive data recovery tool to recover pen drive data, I got back all the files and folders back that were lost due to formatting. The Pen Drive Data Recovery Software works perfectly well to restore deleted data from Pen Drive. It helped me to recover two files storing important presentations and documents. Thanks a Lot.